Join the Imperial Valley Cancer Support Center for a night of friends, laughter, art and wine at their "Be My Valentine" Paint & Wine! Try your hand at painting while enjoying delicious appetizers, good music and of course, a great glass of wine (or soda!). 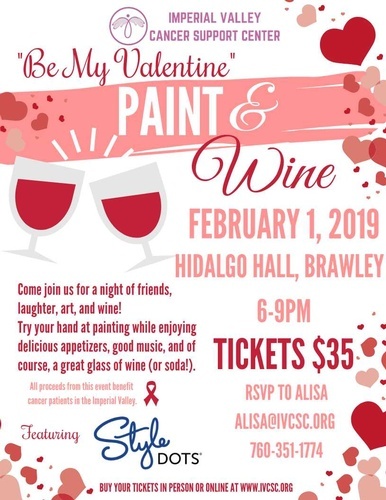 "Be My Valentine" Paint & Wine will take place on Friday, February 1, 2019 from 6-9 p.m. at the Hidalgo Hall in Brawley. Tickets are $35 per person. RSVP to Alisa, alisa@ivcsc.org or call (760) 351-1774. All proceeds from this event benefit cancer patients in the Imperial Valley.